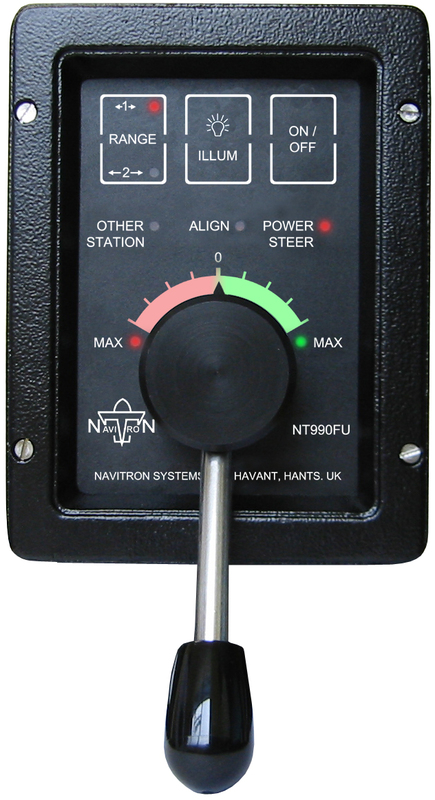 Navitron Power Steer controls are intended for installation in sheltered (bridge or wheelhouse) locations and are suitable for use as single or multistation units with all Navitron autopilot types. When NFU is selected, the autopilot course setter is automatically switched to a 'tracking' mode. Subsequent movement of the jog lever produces a turn to Port or Stbd (as appropriate) which is 'tracked' by the course setter card as the vessel is power steered to a new heading. When the required new heading is attained and the NT920NFU switch is set to DODGE or OFF, the autopilot course setter card immediately 'locks' and the autopilot resumes control to maintain the vessel on the new (current) heading. When the NT990FU is engaged (ON) and the vessel is power steered to a new heading by this means, the autopilot course setter card 'tracks' ships head. On attainment of the new heading required, the NT990FU key can be set to OFF at which time the course setter card automatically 'locks' and the autopilot immediately resumes control to maintain the vessel on the new (current) heading. Identical in function to the fixed station NT920FU the Navitron Hand Held Remote Steer Control type NT920HRC is fitted with a 3 metre length of trailing cable to provide portable follow up power steer control.